This review is about the electrical hairbrush One Step Dryer by Revlon. I have tried out the Revlon Paddle Brush over the last two months and want to share the experiences I made with you. I will report about its functions, pros and cons as well as its usage in general. How did I come across this Electric Hairbrush by Revlon? At first, you need to know that my hair is really long and thick. It may look beautiful and healthy but it really needs a lot of care and, most of all, patience. My personal styling routine looks like this: washing, blow-drying, straightening. I need these three steps to bring my hair in position. But this procedure got really tiresome over time. I didn’t want to spend so many hours styling my hair in front of the mirror. I already used only high-quality devices for styling, like this hairdryer by BaByliss for example. While searching through the internet I noticed the Revlon One Step Dryer. This paddle brush is able to dry the hair and straighten it in only one step. Therefore I thought one step of my daily styling routine could be removed! 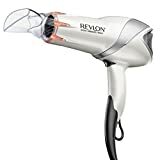 1 Revlon 1875W Infrared Hair Dryer for Faster Drying & Maximum Shine 405 Reviews $16.69 SHOP NOW! 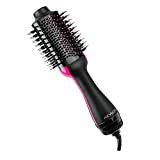 2 Revlon Salon One-Step Hair Dryer & Volumizer 171 Reviews $49.99 SHOP NOW! 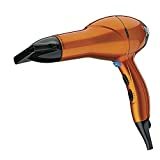 3 Infiniti Pro by Conair 1875 Watt Salon Performance AC Motor Styling Tool / Hair Dryer; Orange... 1253 Reviews $19.99 SHOP NOW! The electrical hairbrush by Revlon looks big and unhandy at first glance. But don’t be fooled by this impression. This device is really light and weighs only 400g. The feeling while holding it is just right. In comparison to other mid-sized hairdryers this brush is almost 50% lighter. For me this is a huge plus! I need to hold the styling device quite long in my hands while my daily styling routine. The long cable and rotatable hinge provide sufficient mobility. Even though I am really happy with the Revlon One Step Dryer I still have a few points I would improve after gaining knowledge and experience about this product. There are three heat settings you can use for styling: cool, low and high. For me, setting the dryer on “high” is too hot, I notice it most when I come close to my ear. I only need the first two settings for my thick and long hair. Another point I’d like to criticize is the noise. I think this paddle brush is rather loud in action compared to how the video makes it seem in the product description. The noise volume of this brush is just the same as any other dryer. Another thing I don’t like is the smell of this paddle brush. Of course, I know that plastic can stink a bit and that this is unavoidable. Least of all if the product is new. But I just wished for it to smell less artificial. But I must say that as long as the result of the Revlon One Step Dryer stays this well, then for me the negative points count less than the pros. First I dry my hair with a towel. Then I split my hair into two layers. I start with the lower part and work myself up bit by bit. I place the paddle brush on the hairline and let it slide down to the tip of my hair. This way the hair will get dry and smooth, in just one step. You can perfectly style the back of your head without twisting your arms. This brush totally lives up to its promise concerning the styling results. I am really happy with the styling result of the Revlon One Step Dryer! My hair is dry and straightened in just one step. I clearly need less time to style my hair with the paddle dryer than with my usual styling products like my hair dryer combined with a hair straightener. This concept of combining a paddle brush with a hair dryer is just the right thing for me. In any case, I still think the next generation of the Revlon Dryer could bring some improvement in noise volume and smell. But all in all I can give this device 8 out of 10 points. I am definitely going to stick with the electrical hair brush by Revlon for styling my hair. Do you have some experience with Revlon Paddle Dryer & Styler?